With the words "We Are Not Things" scrawled on the walls of the tyrant Immorton Joe's (Hugh Keays-Byrne) vault, Mad Max Fury Roadkicks its high-octane road race into full gear. 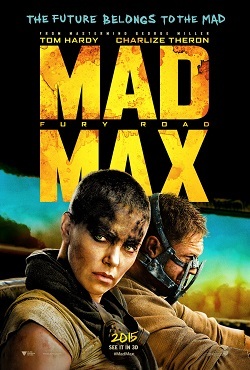 We learn that one of Joe's trusted lieutenants, Imperator Furiosa (Charlize Theron), has liberated and is taking to safety several young women Joe had kept in the vault, some of whom are pregnant with his children, and that he wants them back. Caught in the middle of the escape and pursuit is Max Rockatansky (Tom Hardy) a man of few words, a man of action and driven mad in a world deprived of sanity. Max, like the young women, was also held captive by Joe: Max for his healthy blood and the women for their ability to bear healthy children in a barren wasteland irradiated by apocalyptic nuclear fallout. Director George Miller, a filmmaker with diverse tastes who directed the three previous Mad Max films, gives viewers a rollercoaster rock-opera of achase film. First, the chase is to get away, then the chase is to return to where everything started. 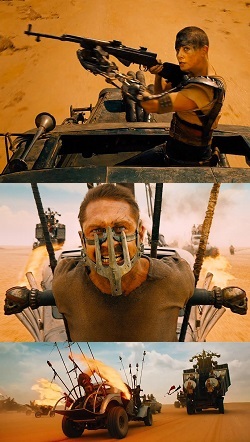 Loaded with practical, real-time effects and limited CGI Mad Max Fury Road has a solidity many modern films miss. Miller also gives audiences long stretches with little to no dialogue where Theron, Hardy and the other actors must tell their story silently with glances and winces as the motors roar through the desert. The film’s high intensity and violence will be too much for many viewers. 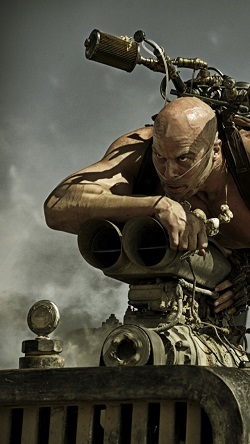 If you have never found Mad Max appealing, then this movie won’t change that. This auto-based film is not Morgan Freeman chauffeuring Jessica Tandy in the multiple-Oscar-winning Driving Miss Daisy (1989)! That said, the film’s technical aspects could garner Oscar attention, as could its look and design as it is truly a cut above the rest of the pack in the rather crowded post-apocalyptic dystopia genre. In the Old Testament book of Judges there is a recurring phrase: "In those days there was no king in Israel. Everyone did what was right in his own eyes" (Judges 17:6). Of course there were other kings in the land, like Eglon the king of the Moabites, and in Mad Max Fury RoadImmorton Joe is this sort of king—an oppressive ruler living a life of excess while others work to serve him. His twisted and perverse "pleasures" ripple out from his stronghold, and the fingerprints of what he sees as “right” can be witnessed on everything he touches. Among Joe's warriors is Nux (Nicholas Hoult) a young man moulded and shaped by Joe's new world vision, a man with Joe's fingerprints all over him. Nux and the rest of Joe's warriors look like skeletons in part because they know they have shortened lives due to the spoiled environment. Yet, even skinned in death, they have some hope which is reflected in their mantra: "I live. I die. I LIVE AGAIN!" Joe has provided them with a vision of an afterlife and when Nux says "If I'm gonna die, I'm gonna die historic on a fury road!" he says it with a hope of going to Valhalla where he will be "shiny and chrome." Christians don't hope to go to a twisted version of the Norse mythological Valhalla, the "Hall of the Slain," our eternal hope is to live with Christ. Joe however hasn't provided his subjects with Christian instruction. Nevertheless, in their broken world, there are hints of Christ. There is a hopeful longing for something more, a hunger for redemption, even a desire to pray. In a brief exchange between the escaping young women, Toast (Zoe Kravitz) asks The Dag (Abbey Lee), "What are you doing?" The Dag responds, "Praying." Toast asks,"To who?" The Dag answers, "Anyone who's listening." Toast: "What are you doing?" The Dag: "Anyone who's listening." Mad Max Fury Road presents a world living on fragments of the past that in many ways are precious and revered. This is why Joe's "half-life" War Boys have engine parts scarified into their chests. Director Miller says it was to show how Joe's followers venerate cars and engines as semi-religious objects because the cars survived the apocalypse. Thematically the film is about survival, the survival of bits and pieces of the old world and the people who live in the broken new world. Immorton Joe is focused on biological survival but approaches it in a largely wicked, heartless and selfish way. Furiosa is rescuing the young women because they are looking for hope. Their survival depends on getting them away from Joe to a safe place. She wants to get them to "the green place" where she grew up and from which marauders had abducted her and her mother. When it comes to her own survival Furiosa clings to the possibility of redemption. That is what she is looking for. Max simply wants to survive. He is the film’s pivot point, the catalyst for change. It would be expected that a man focused on survival would exhibit selfishness, that he would simply be another Immorton Joe fighting his way to the top of the heap, but this is not so. Rather, Max becomes an agent of grace even while he finds himself saying things like, "hope is a mistake." In spite of his moments of personal torment and anguish, grace is shown through Max in a number of ways. One obvious way, which is one of those hints of Christ in the film, is when he freely gives his blood to extend the lives of others. Perhaps the most poignant moment comes near the end of the film where Max could have rightfully demanded or received payment or reward for his efforts. Instead, Furiosa looks down to see Max simply blend into the crowd and vanish out of sight. That brief exchange of looks is a moment of pure grace. Max proves himself a man who didn't do any of it for reward and while he's likely still going to be a haunted soul Max did the things he did as a gift because Furiosa, the young women, Nux, and all the people Immorton Joe had enslaved needed it. They simply needed to be saved. If the George Miller Mad Max films have no appeal and something more family-friendly would be more appreciated, consider his other films: Babe (1995), Babe: Pig in the City (1998) or Happy Feet(2006) or Happy Feet Two (2011). 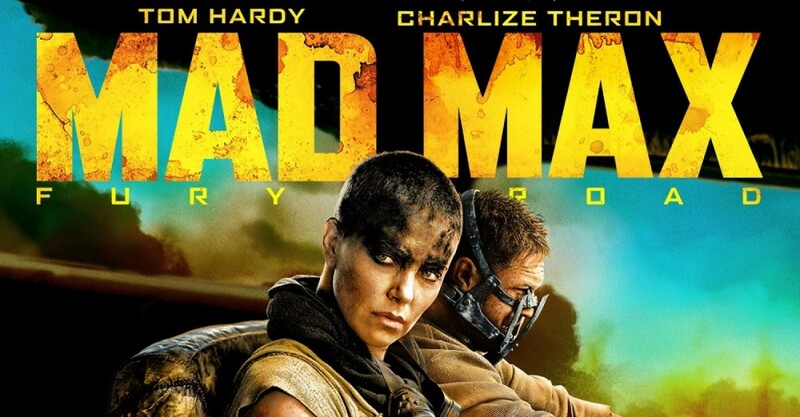 However, if explosions and mayhem with a simple yet effective well-told story (including a couple unexpected twists and turns), well-acted by a strong cast is the order of the day, then Mad Max Fury Road will not disappoint. For a revved-up action film it is value for your money but be warned it is rough and has surprisingly emotional moments that can take viewers by surprise. After seeing a movie like Fury Road it's good to remember to buckle up and keep to the speed limit on the drive home from the theatre!